This painting was created by Hy Hintermeister for use on a 1938 calendar, as the third in the "Great Adventure" series of calendars for the Shaw Barton Calendar Co. 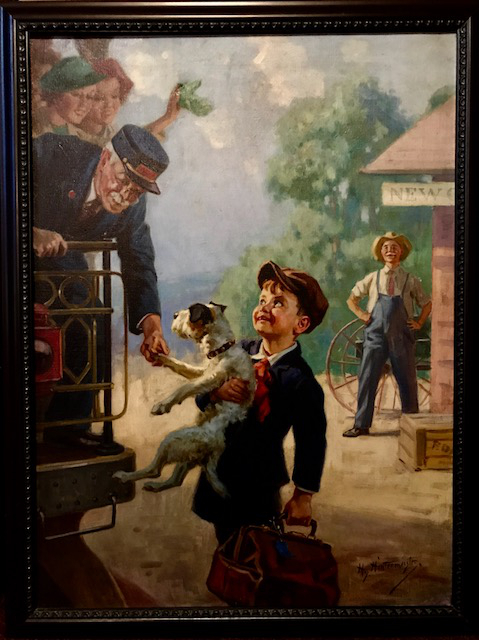 This young boy is traveling with his dog on a train to visit his grandfather on the farm for the summer. As he exits the train, it appears as though he has made some new friends along the way...including the train's conductor. This painting is titled, "Everybody's Happy".